A Shipping Rate List is a set of country-based shipping rates that you can assign to a product. For example, if you are selling t-shirts and chairs, you can create two different shipping rate lists for them. Go to the Store section in Pixpa Studio and click on the Shipping link. On the Shipping page, click on the Add Shipping Rate List button to create a new shipping rate list. You can also edit (1), duplicate (2) or Delete (3) any existing shipping list on this page. 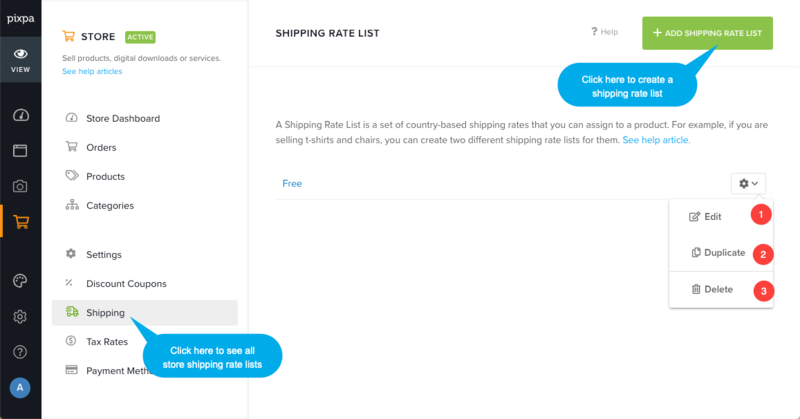 On clicking add shipping rate list button, You would see the options for new rate list. 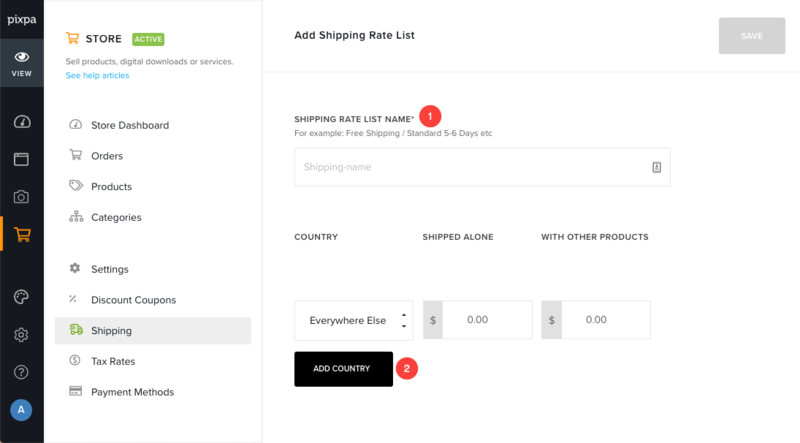 Add Country – You can create a list of locations (countries) and specify the shipping rates for shipped alone and for with others (of the same product). For example, if a customer buys a single product, the shipping rate specified for the one item is applied. However, if the customer buys three items of the same product – the one item shipping rate is applied for the first product and the each additional item shipping rate is applied for the other two products. To add more locations (countries), click on the Add Country button. 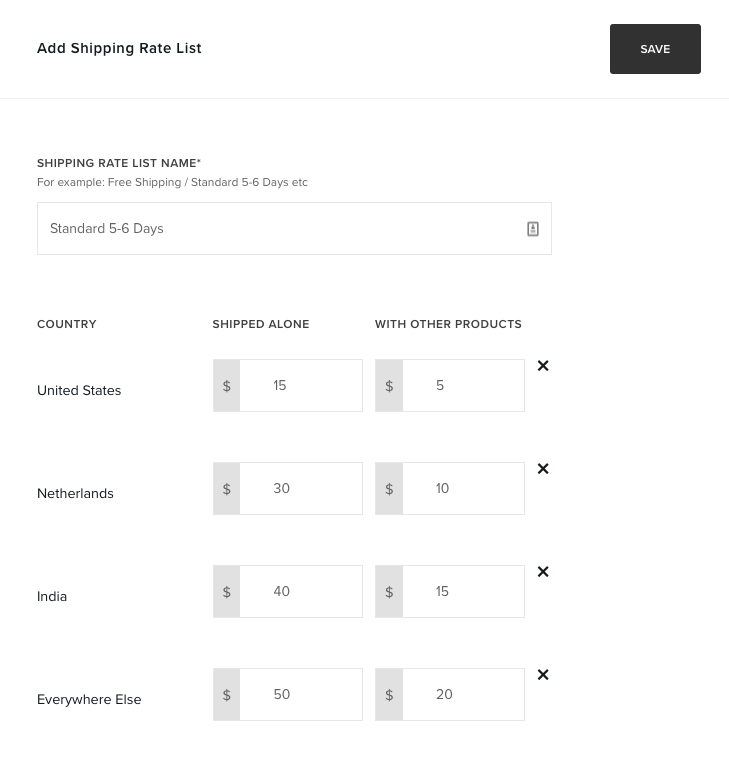 And, Choose Everywhere Else from the dropdown if you want to ship worldwide and want to assign a flat rate for all remaining countries that are not included in the rate list. Save the shipping list. That’ it. Now, Apply the shipping rate lists to particular product. Click here to see how.